Create mood/activity based playlists from your own music. Is there a better alternative to MusiMoods? Is MusiMoods really the best app in Entertainment category? 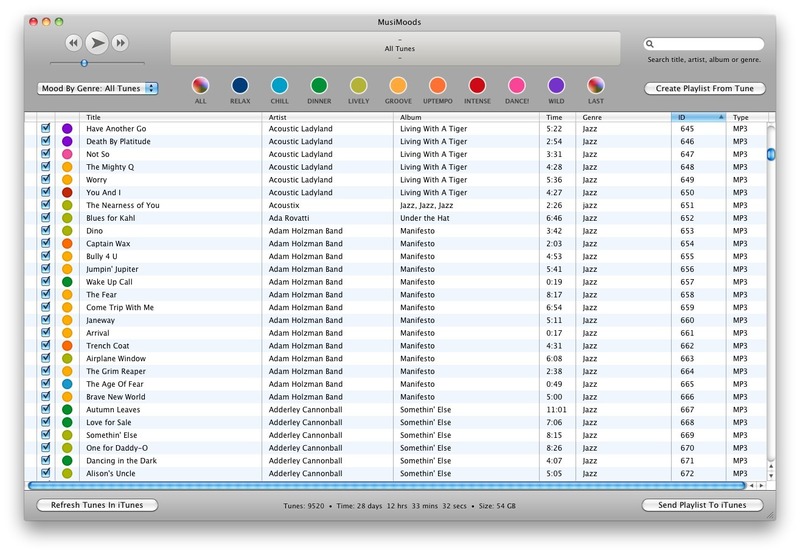 Will MusiMoods work good on macOS 10.13.4? MusiMoods can instantly create great mood- and activity-based playlists from your own music. Export your playlist to iTunes, or enjoy in the basic MusiMoods player. The free version supports 1,000 tunes. MusiMoods is a gorgeous and sophisticated, yet easy-to-use mood- and activity-based playlist creator. Simply add your music and select a mood. Refine your playlist by selecting a specific genre and mood, or refine your selection more by using the tune-based playlist creator feature. Note: Available for free until the end of 2015! Fixed an issue where some MP3 metadata appeared as "Unknown"
MusiMoods needs a review. Be the first to review this app and get the discussion started! MusiMoods needs a rating. Be the first to rate this app and get the discussion started!